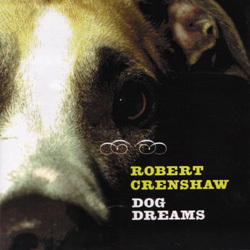 Gadfly Records is proud to announce the release of "Dog Dreams," a new CD from pop maestro Robert Crenshaw. Master pop/rock song craftsman Crenshaw and his talented crew -- including power pop producer/guitarist supreme Jamie Hoover -- are back with another set of melodic, hook-laden jems. "Dog Dreams" is another platter chock full of hooks and harmonies galore. In addition to 12 studio cuts, "Dog Dreams" also includes 2 bonus live tracks of Crenshaw and his band beautifully interpreting the Dylan classic "If Not For You" and the Jackie Deshannon hit "Everytime You Walk Into The Room." The CD also includes an amazing studio cover of the Vogues classic "Five O'Clock World." The younger brother of pop/rocker Marshall Crenshaw, Robert played in a number of bands around the Detroit area before joining Marshall's band as the drummer and background vocalist through the first five critically-acclaimed Marhsall Crenshaw releases. After taking a short hiatus from the music business, he returned in 1999 to take center stage with "Full Length Stereo Recordings," following that up with 2001's "Victory Songs."